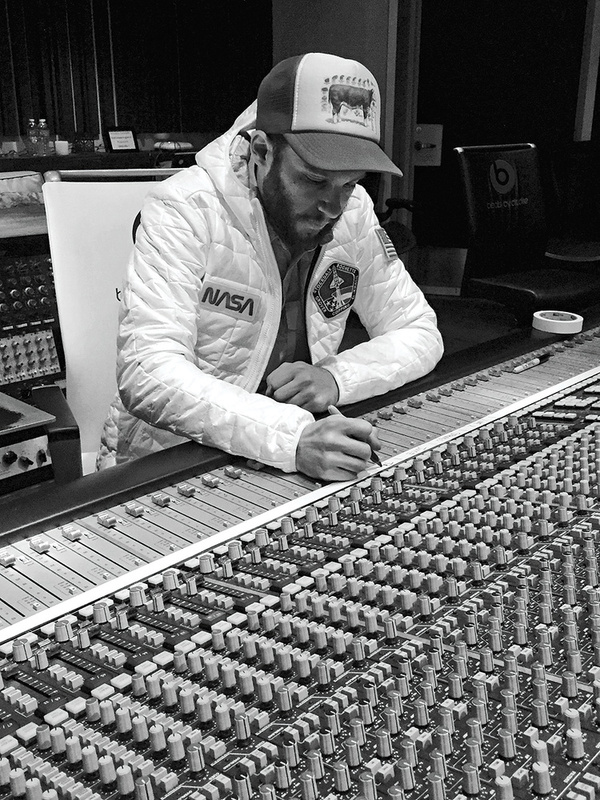 Matt Schaeffer has been Kendrick Lamar’s main engineer since 2014. After half a decade or so at the top of the game, Kendrick Lamar has already had 12 Grammy Awards and three number one albums. The first two were To Pimp A Butterfly (2015) and DAMN. (2017), and while the third is not technically under his name, Lamar is nonetheless the driving force behind Black Panther: The Album — Music From And Inspired By. The album was, at the time of writing, number one in the US charts, and the superhero movie that inspired it had grossed more than one billion US dollars in the few weeks since its theatrical release on February 16. Black Panther: The Album — Music From And Inspired By was curated, and mostly co-written, by Kendrick Lamar.Photo: Batiste SafontLamar is known for being incredibly productive and as someone who adores spending time in the studio working on new music, so when he was asked to write a few songs for the Black Panther movie, he wasn’t going to pass up the opportunity. When director Ryan Coogler showed Lamar parts of the unfinished movie, the rapper was so enthusiastic that he booked several months of studio time and ended up co-creating an entire album, in close collaboration with Mark Spears, aka Sounwave, the main in-house beatmaker and producer at Top Dawg Entertainment. 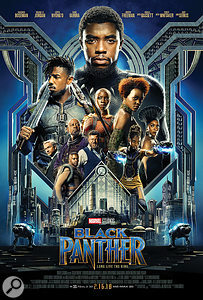 Black Panther in fact spawned two soundtrack albums: the Original Soundtrack album with music by Swedish film composer Ludwig Göransson, and Music From And Inspired By, ‘curated by’ Lamar. He had a hand in the writing of all of the album’s 14 tracks, while Sounwave co-wrote and co-produced 11. Other writers and producers involved include Frank Dukes, Doc McKinney, Cubeatz, Mike Will Made It and many others, and in addition to Lamar there’s a whole swathe of performers, including big names like the Weeknd, Future, SZA, 2 Chainz, Vince Staples, James Blake and Travis Scott. Göransson co‑wrote only one of the tracks, ‘Opps’, which contains one of the few bits of the Lamar‑curated album that’s actually used in the movie. Recording sessions for Black Panther: The Album took place in a whopping 13 studios, if you count the places where the album’s many guest producers and guest artists recorded their contributions. A substantial amount of original material was written by Lamar and Sounwave on the rapper’s tour bus while on the US leg of his DAMN. tour, but most of the work done by the duo on the soundtrack album took place at Windmark Recording and Interscope Studios in Los Angeles from September 2017 to January 2018. According to Schaeffer, some of the instrumentals for Black Panther had their starting points in loops created by third parties. In the case of lead single ‘All The Stars’, for example, the initial impetus came from British beatmaker Al Shux. 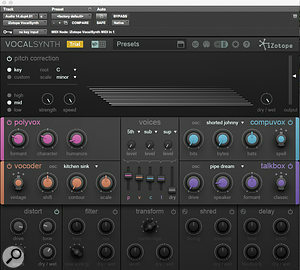 Schaeffer: “Sounwave built the beat around the synth pads that Al Shux sent. Sounwave has an MPC Studio with MPC software and plays melodic parts with a MIDI keyboard, and he will then transfer these to Pro Tools and continue to work in that. In most cases we were fully in the box, but sometimes we used controllers like instruments, recording straight into Pro Tools. For example, Wave would play his MPC like a drum set, and we’d record that directly into Pro Tools, and we’d then edit and quantise what he’d performed. In other cases we’d start with programmed beats and we’d then overdub instrumentation like a bass, or keyboards, or other things. Other live instruments that were played on Black Panther: The Album, in addition to the two live violinists, were keyboards, played by James Blake on ‘Bloody Waters’, a track on which he also sang, and bass and guitar played by Rob Gueringer on ‘Seasons’. Everything else was programmed in the box, meaning that the main role of the engineer during recording was to track vocals. Performers such as the Weeknd and Vince Staples did their takes remotely and sent them in, but Schaeffer recorded many of the others. Naturally, his focus was mainly on recording Kendrick Lamar (see box, below). Schaeffer conducted all recording sessions and mixes in Pro Tools. As is common when working in the box, it meant that he often was already mixing during tracking, but there was also a separate mix stage. “A big part of the mixing process,” explains Schaeffer, “at least in hip-hop, is getting the stems of the individual instruments when a track is getting ready to be mixed. Most of the time we’re overdubbing to a two-track mix of the beat. The producer will send us the stems later on, and fitting them into the session often is not straightforward, because sometimes they don’t match, because we may have changed the tempo or the structure of the song, and so on. Before I can start mixing I need to not only get the stems, but also re-edit them to get them to match what we have. “With Kendrick, the line between recording and mixing is definitely blurred, so while I do some mixing during tracking, there are other issues as well that push me into doing a separate final mix. For example, all these last-minute changes, which may mean that new vocals are added, mean that the mix perspective constantly changes and is not clear until the very end. Also, sometimes samples don’t get cleared and we have to make changes nobody really wants to make. The sample issue usually comes up very late in the process, sometimes when something is already mixed, and then we have to replace these samples and rebalance everything. Although Schaeffer was usually mixing in studios that had large-format consoles, he doesn’t usually lay his mixes out on them. “I was Derek Ali’s mix assistant for a couple of years, and everything we did was analogue, or at least a hybrid. I helped him do his mixes on a console, usually an 80-channel SSL, and we tended to use all the channels! But it is difficult working in analogue with someone like Kendrick, who makes arrangement and production changes all the time, even during mixing. When mixing To Pimp A Butterfly we sometimes had to do desk recalls, and workflow was too time-consuming for a project like Black Panther, for which we had a hard deadline. With Butterfly we also were printing our mixes to half-inch tape, and because things changed so much, we eventually we ran out of GP9 tape, and we had to realign the tape machine for a different tape formulation. Once Schaeffer has all the necessary tracks in his session and has them pulled back to a manageable level, he can start the process of actually mixing. “A lot of the time I start with the kicks and 808s, and then the snare, and I get a good basis going with the drums. After that I’ll begin to add other things, maybe the vocals first, or maybe synths or other instruments. It depends on the song. There have been times when I started with vocals and worked backwards. In the case of ‘All The Stars’ I started with the drums, but there also is a synth pad that I had going all the time I worked on the drums, because the pad has a lot of low end in it, and I wanted to make sure that the drums were not conflicting with it. ‘All The Stars’ is a duet between Kendrick Lamar and singer Solána Imani Rowe, aka SZA.‘All The Stars’ is the first of three singles that had at the time of writing been released from Black Panther: The Album, and reached the top 10 on both sides of the Atlantic. With a Daft Punk‑like robotic pre-hook sung by Lamar and a catchy and dramatic main hook sung by SZA, it uses a VI-IV-I-V chord progression that neither starts nor ends on the tonic. This gives the track a rather suspended, unresolved feeling, and it’s no surprise to discover that the same chord sequence has reportedly been associated with trailers for heroic Hollywood movies. Instrumentally, the most distinguishing characteristics of the song are a four-to-the-floor kick drum, a heavy synth bass, a synth pad embellished by strings, tuned-percussion-like parts that are panned sharp left and right, and a relatively heavy snare during the hook. Lamar raps the first verse, while SZA sings the second verse. The final Pro Tools mix session of ‘All The Stars’ is tidily organised and titled, though many of the beat clips are simply called ‘Untitled’. In total, it contains 86 tracks: from top to bottom, these are a mix print track, a ‘Print Bus’ and a ‘Beat Sub’, six audio tracks of Al Shux production, 17 audio tracks of Sounwave production, one reverb aux track called ‘Beat Valhalla’, 15 violin audio tracks and associated submix aux called ‘Vln Σ’ (Schaeffer uses the sigma sign to denote a summing bus), a violin reverb track, eight aux effects tracks, one ‘Hook Ref’ submix aux track, an ‘SZA Σ’ vocals summing bus aux and another three SZA aux effect tracks, two SZA hook lead vocal audio tracks, a summing bus track for Lamar’s verse lead vocal audio track, 10 SZA second verse vocal audio tracks, 10 Lamar pre-hook vocal audio tracks, which include four lead and six backgrounds, a Lamar pre-hook background submix aux track, and another four effect aux tracks. This view of the Pro Tools Edit window shows some of the beats, which were programmed in some cases by cutting and pasting audio clips rather than using MIDI. Although the vertical waveform zoom level has been raised to make the contents of each clip visible, Pro Tools’ Clip Gain feature has been used to reduce most of them in level by up to 15dB. Particularly noteworthy in this session are the large amount of aux effect tracks, and the fact that the submix vocal tracks have an enormous amount of effects. The aux track through which all SZA’s vocals are routed has 10 inserts and seven sends, and Lamar’s verse lead vocal aux has eight inserts and five sends. The eight inserts and two sends on Lamar’s pre-hook backing vocals seem almost modest in comparison, as do the four inserts and six sends on the Hook Ref track, to which all Lamar’s pre-hook vocals are sent. Schaeffer takes it, as they say, from the top, initially bypassing the master tracks and commenting on his aux tracks, and the challenge of working with tons of tracks called ‘untitled’. “Yes, Sounwave tends to call all his tracks ‘untitled’, which can be confusing. You have to be able stay organised when you’re not given titles. I only have seven or eight aux tracks in my template, with maybe two reverbs and a couple of delays and something like a chorus or a SoundToys MicroShift aux. Some of the additional aux tracks in this session come from tracking, like the DVerb aux. I like using that during tracking, because it’s light in the DSP and it sounds good. I then added more reverbs to that during mixing. Other aux tracks I added specifically for this mix. “As I mentioned, I began this mix with the drums, while also playing the two synth pads, which are part of Al Shux’s six tracks. When we were recording we did not have the individual synth tracks split out, and instead we had submix tracks, which are in blue. I liked the processing I had added to these submixes, so left them in the mix session. I then later added the individual stems, which are the three green tracks. Normally I hide these submix tracks and make them inactive, but in this case everything sounded good together, so I left it all in! Matt Schaeffer applied extensive and detailed processing to many of the programmed elements. Here, as an example, are the EQ and compression settings applied to the ‘Untitled 002’ intro synth pad. 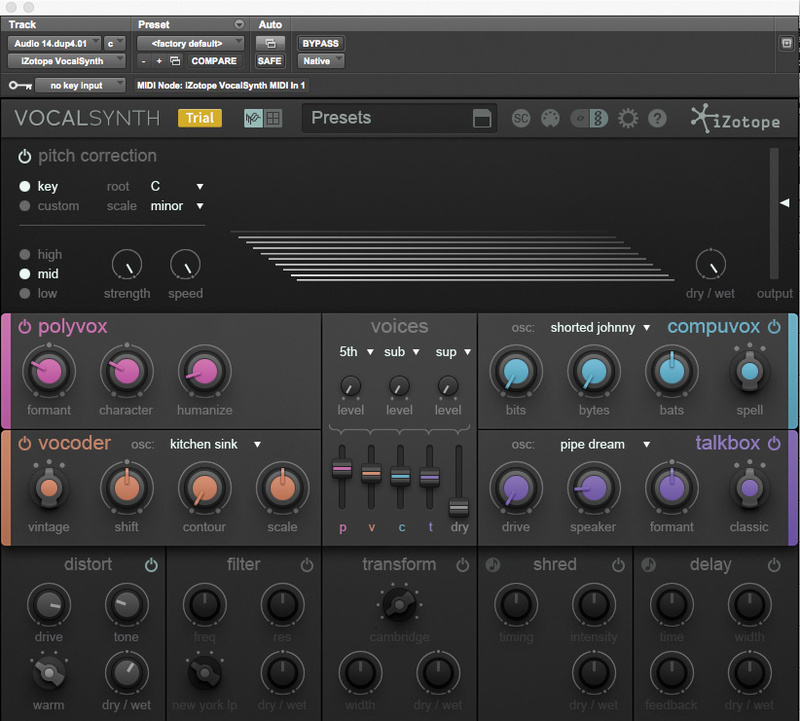 “To give some examples of the treatments I used here, the ‘Untitled 002’ track at the top is the sum of all the synths and I use the [Avid] EQ3 seven-band to boost 40Hz, cut at 576Hz and boost at 2.57kHz, plus there’s a Waves Renaissance Compressor with a ratio of 4.8:1, holding everything in place. I wanted to add more low end, and I boosted some upper mids, to give the synths more presence. The notch around 576Hz is because it sounded muddy in that area. The next track down is the same part, which I pulled down for different treatment, and it has an almost identical EQ curve, just boosting a little higher at 4.12kHz, because I wanted it to cut through a bit more, and the SoundToys Microshift, set to Style 1, to stereoise the part a bit and make room for the vocals. “The first of Sounwave’s track is the main kick, called ‘Untitled 010’, on which I have the SPL Transient Designer, taking the sustain down a lot, and the FabFilter Pro‑Q2, boosting around 40Hz, dipping around 100Hz, and after a small boost just above that, cutting everything above 500Hz. I just wanted that low-frequency information. I also like to bring the sustain down a lot on the kick with the SPL. Sometimes I use the expander on the SSL Channel Strip for that same purpose. The kick drum sound heard in the track is layered from several different elements. This one provides the main low-frequency content. 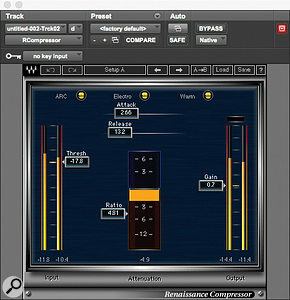 The SPL Transient Designer plug-in is used to reduce the ringing sustain, while the EQ rolls off everything above 500Hz, allowing the upper-mid aspect of the drum sound to come from other samples.“The ‘Punch kick’ 1 and 2 below the main kick are programmed, and copied and pasted, hence all the edits. 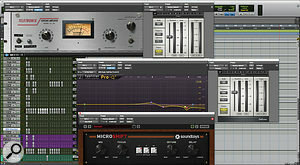 ‘Punch 1’ has the Waves SSL E-Channel, the SPL Transient Designer, the RCompressor and the Decapitator, while Punch 2 has the Pro‑Q2 instead of the RCompressor. All these plug-ins are really there for more punch. I was trying to get these kicks to hit as hard as I could! 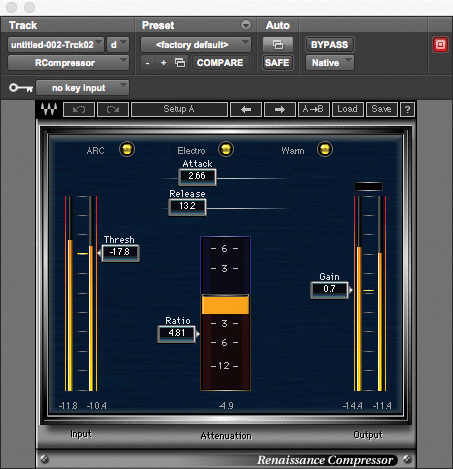 The E-Channel has compression to bring out the transients. On kick drums I like to have a slow attack, so it does not crush the transient too much, and a pretty fast release. I think there was some mud in the mid-range, so I took that out with the Q2, and I also boosted low end with it before the signal hits the Decapitator, because I wanted the sound to break up in a certain way. That’s a lot of plug-ins for a handclap sound! Matt Schaeffer used multiple distortion and saturation processors in series to create the effect he was after.“Yes, there are lots of plug-ins on the claps! I added eight plug-ins to give them the right amount of punch and grittiness. The signal chain is the SSL E-Channel, UAD 610, SoundToys Devil-Loc, Avid DVerb, Valhalla Vintage Verb, UAD 1176LN, the SoundToys Little Radiator and SoundToys MicroShift. I like to boost the input with the 610 as well as the top end with its EQ, because that plug-in adds some pretty cool harmonic distortion. The Devil-Loc and the Little Radiator also add some dirt. I have the two reverbs on the inserts because I did not think I was going to use these settings anywhere else, and I like to compress after the reverb, here with the 1176, because it brings out more ambience. The MicroShift adds a stereo effect to keep the claps out of the centre, in this case to make room for the snare. “There are no plug-ins on the violin audio tracks, because I had already done processing in the violin tracking session and printed that. The violin tracks in this session are the violin stems that I bounced down. Each one of those tracks is one part, overdubbed eight times. All violin audio tracks are sent to the ‘Vln Σ’ aux, which has the EQ3 seven-band, which I used for a low cut at 100Hz and another cut at 1.39Hz and to add some high end at 9.26kHz. There also is a Q2 that cuts around 500Hz. I really wanted to make sure that the violins did not clash with the vocals. I use multiple EQs in one signal chain all the time. The EQ3 and the Q2 both sound fairly neutral, so I tend to use them for specific frequency adjustment, and not to add character. 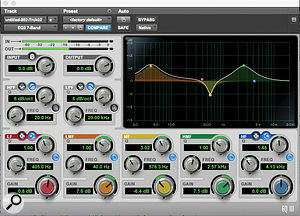 If I want character I may use something like a Pultec EQ. 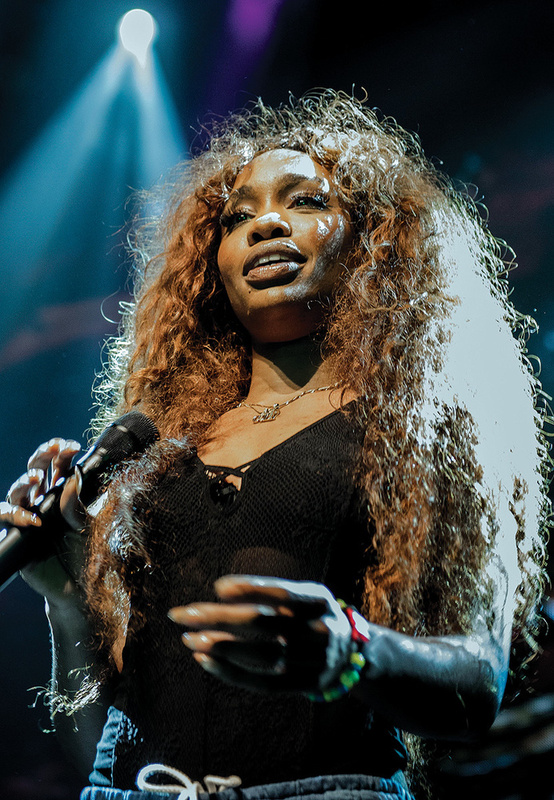 There are 12 SZA vocal audio tracks in total: two for the main hook, one second verse lead track, and nine verse backing tracks, which in fact provide emphasis and overdubs of single words. 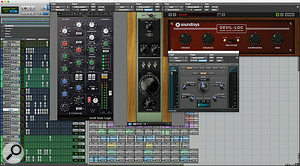 All SZA audio tracks have the Antares Auto‑Tune 8.1 plug-in, the two hook tracks each also have the FabFilter Pro‑Q2 equaliser, and the main SZA verse track also has a de-esser, while the backing vocals have two instances of the Waves RVerb and one of the same company’s H-Delay. Apart from Auto‑Tune, most of the processing is done on the ‘SZA Σ’ aux, to which all SZA audio tracks are sent. The stem through which SZA’s vocals were routed was also heavily populated with plug-ins, including three de-essers set to target specific frequencies. Schaeffer: “The inserts of the sum track for SZA’s vocals consist of the EQ3 seven-band, Waves RComp, UAD Pultec EQP1A, UAD 1176E, Waves De-Esser, UAD LA2A, another Waves De-Esser, the Pro‑Q2, yet another Waves De-Esser and the SoundToys MicroShift. The De-Essers affect 11400Hz, 15032Hz and 2000Hz respectively. I like stacking de-essers set to different frequencies. 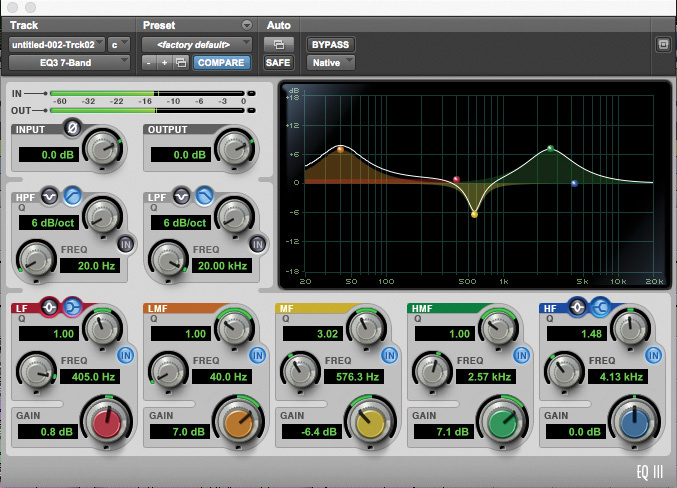 It works like narrow multiband compression. Sometimes I will in fact use a multiband compressor, like the Waves C4, but if the vocals have very specific harsh frequencies, I prefer to use several de-essers. They also are helpful as I like boosting high frequencies in vocals; here, the EQP1A boosts 16kHz. The EQ3 has a high-pass at 216Hz and cuts at 695Hz, and the Q2 lowers the high end to some degree. When a frequency bothers me, I usually sweep through [with a band set temporarily to boost] to find the frequency and then I cut. The MicroShift provides a little extra width and a slight ambience with the delay parameter, without actually making the vocal sound too stereo. 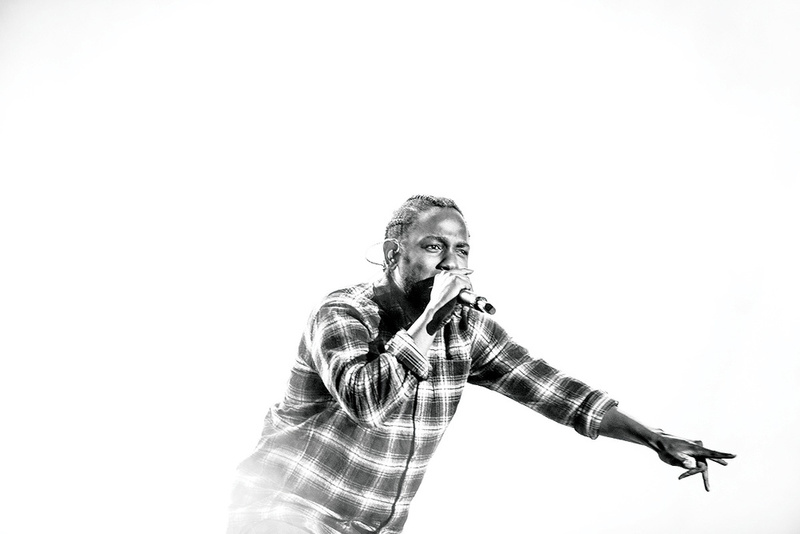 Kendrick Lamar’s vocal audio tracks, named after his teenage stage name K.Dot, consist of his first verse rap track, ‘VS 1 LD’, and 10 tracks for three moments in the track where he sings the pre-hook in a robotic voice. The verse rap track only has the AIR Flanger on it, and is sent to the ‘Dot VS LD’ aux track, which has eight inserts and five sends. 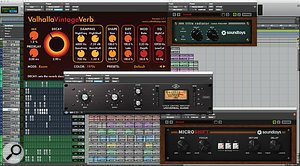 Nine of the 10 pre-hook tracks have Auto‑Tune, while the top four have a number of plug-ins on the inserts, including the EQ3 seven-band, Waves RVox, UAD Galaxy Tape Echo, SoundToys Little AlterBoy, SoundToys MicroShift and Valhalla Vintage Verb. 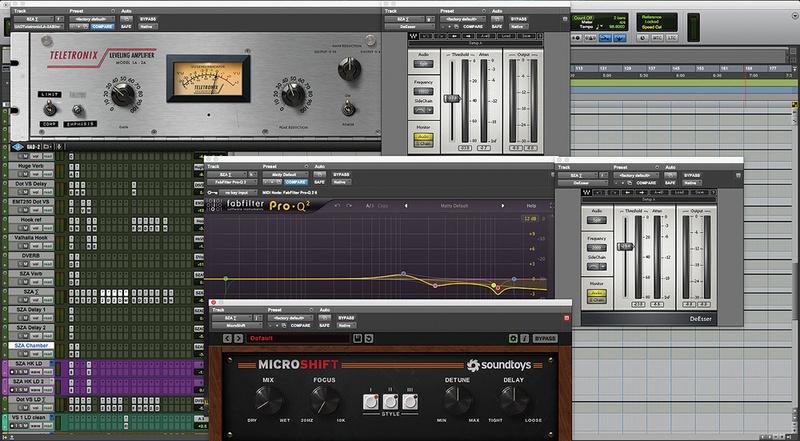 These four are sent to a ‘Hook Ref’ aux track higher up in the session with another four plug-ins on the inserts and five sends. The other six are backing vocals to the four other pre-hook tracks and have no other plug-ins, other than a Trim, and are sent to a ‘Hook Background’ aux, just below them, which itself also is sent to the ‘Hoof Ref’ track. It’s a pretty complicated vocal signal chain, as Schaeffer admits. “The ‘Dot VS LD’ aux indeed has a lot of stuff on it! I did most of the processing on that bus. On the inserts there are the SSL E-Channel, Waves RComp, Waves Q10 EQ, Waves DeEsser, UAD LA2A, UAD Pultec EQP1A, SoundToys Decapitator and Pro‑Q2. The SSL channel strip, Q10 and RCompressor remain from the tracking, and maybe the DeEsser as well, but I most likely messed with the settings more during mixing. The Q10 has a high-pass at 50Hz and I notched out a frequency that was bothering me around 8.5kHz with the Q2. 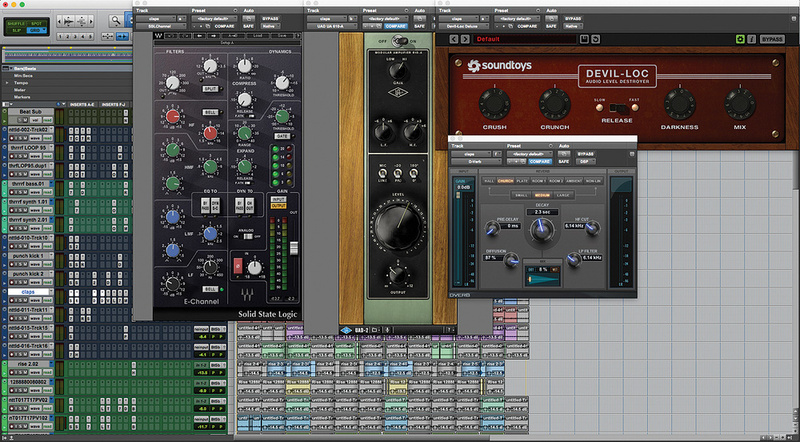 I added the other plug-ins during mixing, and they all add something a bit different. I’m boosting 100Hz and 16kHz with the EQP1A. As I said, I like using several EQs on one thing. “The sends go to a ‘FlangeVerb’ track, on which I put the RVerb and the UAD MXR Flanger, then the ‘Huge Verb’ with the [Audio Ease] Altiverb and EQ3, ‘Hook Valhalla’ with the Vintage Verb, and the SoundToys EchoBoy, the ‘EMT250’ aux with the UAD EMT250, Valhalla Plate and MicroShift, and then finally a send to the ‘Dot VS Delay’ track, with the EchoBoy, set to quarter note, the Reel Tape Flanger and the RCompressor. The EchoBoy is the main delay you can hear in the verse. The EMT250 is not set to a reverb, but to a phaser effect, which gives a cool stereo effect. The Valhalla adds a bit of reverb here, though it’s set to -12, so it only gives a tiny bit of ambience, and the MicroShift makes the whole thing a little wider. It probably still sounded a bit dry, which is why I sent the track to the ‘Huge Verb’ aux with the Altiverb, again taking out low end with the EQ3. Adding all inserts on audio and aux tracks together, Lamar’s verse rap is treated with a whopping 22 plug-ins! The ‘Hook Background’ aux, meanwhile, has the EQ3 seven-band, RCompressor, SoundToys Panman, a chorus, the MicroShift, the UAD MXR Flanger and the Valhalla Plate on the inserts and has sends to an aux track with the Waves Kramer Tape plug-in as well as the aforementioned ‘Hook Valhalla’ aux with the Vintage Verb, and Echoboy, and it then is routed to the ‘Hook Ref’ track, which has another four inserts and five sends. Phew. It all contributes to the overall otherworldly, hypnotic mood of the song, which is also deepened by the suspended chord sequence and mesmeric synths. 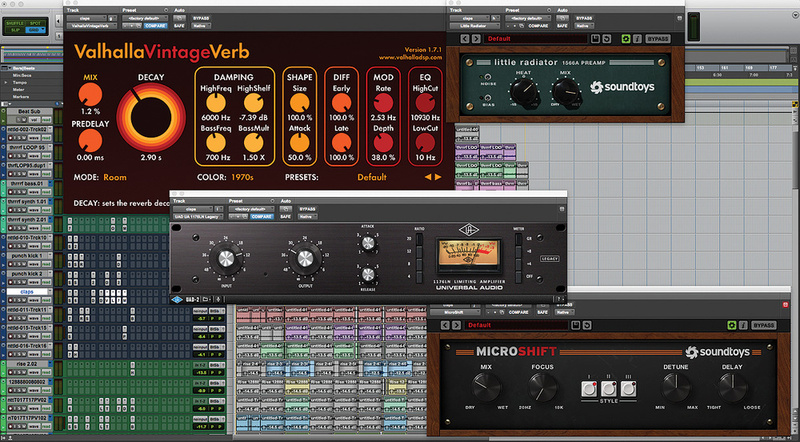 Perhaps because Schaeffer populated his session with so many plug-ins, his final mix treatments are pretty simple. 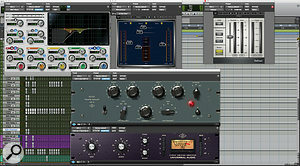 All vocal tracks are, eventually, routed to the ‘Print Bus’ track, on which there’s a UAD SSL G‑series compressor and a UAD Pultec EQP1A EQ, and all beats go to the ‘Beat Sub’, which only has the Waves NLS. Both sub tracks then go to the print track at the top. 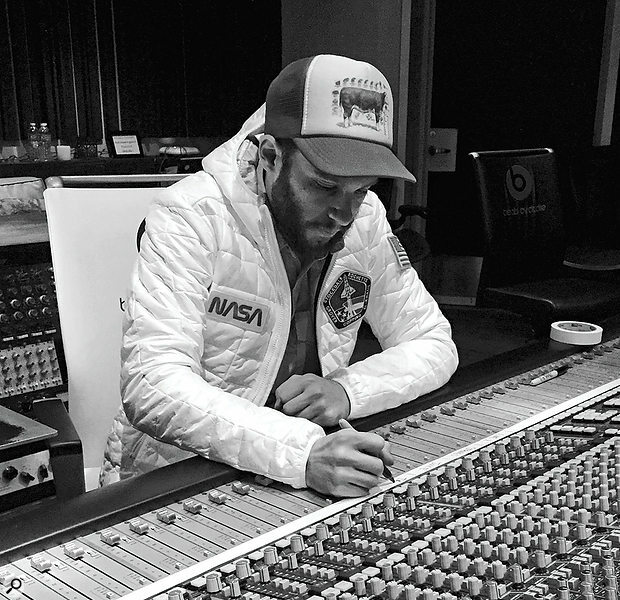 Having been Kendrick Lamar’s engineer for several years, Matt Schaeffer has evolved a distinctive working method for tracking the rapper’s vocals. “When I work with him I always use Playlists on a record track [in Pro Tools]. I will sometimes end up with 300 to 400 Playlists! But we generally don’t go back and edit or comp from these Playlists. These earlier tracks and Playlists are simply steps on the way that we don’t use. Instead we tend to comp what we’re doing as we are recording it, and only if we later realise that there’s a serious problem will we go back and take something from these Playlists. Normally, while I’m recording Kendrick I have empty tracks at the bottom, and I drag everything down to them from the record track. For rap that seems to be the easiest way of working. 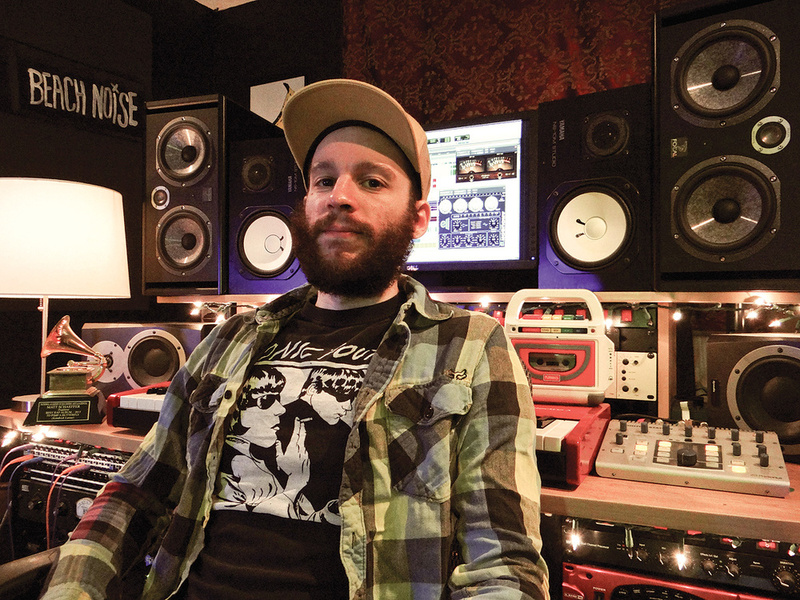 Matt Schaeffer in his LA home studio. Matt Schaeffer has worked with Kendrick Lamar since 2014, when he engineered a number of tracks for To Pimp A Butterfly, and played guitar on one track. He won a Grammy Award for engineering for the album, which also won in the Best Rap Album category. This album was mixed by Derek Ali (who made an appearance in the June 2015 issue of Inside Track: www.soundonsound.com/people/inside-track-kendrick-lamars-pimp-butterfly), but Schaeffer went on to engineer substantial parts of its follow-up DAMN. with fellow Grammy Award-winning engineer James Hunt, and also to co-mix two tracks. On Black Panther: The Album he was the main engineer on 11 tracks and mixed 11 (in two cases he did not mix the same track that he engineered). Talking from his apartment studio in Los Angeles, Schaeffer recalls: “I started playing music in eighth grade in a band, and we recorded some demos at Studio City Sound, where I then interned for a while when I was still at high school. I went to Berklee College of Music in Boston, Massachusetts, where I studied film scoring and engineering. After I returned to LA, I worked in a couple of different studios, and eventually I ended up at Interscope. 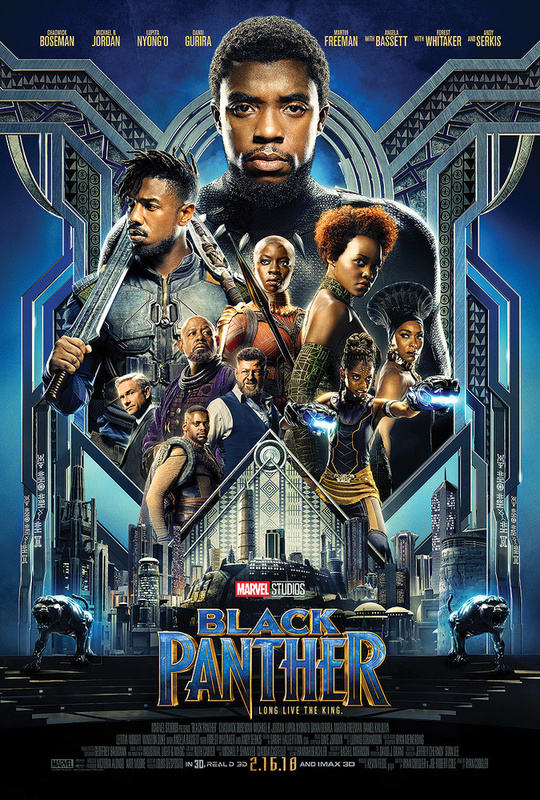 Sometimes the lines between engineering and production get a little blurred and I ended up programming drums and saxophones on Black Panther, which is why I got that an additional production credit on a couple of tracks. But I mainly record and mix. For now I enjoy being involved in the whole process.